For more on the people in the ad, click here. There was a lot of head-scratching last Friday night when Daily Kos released a poll showing Bill Sali an improbable 11 points ahead of Walt Minnick. Sure, Sali is an incumbent in a traditionally GOP district. He's also one of the most extreme and least effective legislators in Congress, a man who can't get his FEC filings straight, and someone who barely won his seat last time around. Well, the Minnick campaign has released its own internal poll (by the respected Harstad Strategic Research) showing that Minnick is, in fact, running about 5 points ahead of Sali (53 percent to 48 percent 43 to 38 percent) and that Sali is hugely unpopular among even Republican voters. The survey was taken among 405 likely voters September 9-11, the week after the Republican convention. Of course, the only poll that really matters is the one that concludes at 8 p.m. on November 4. The Blue Dog Coalition was founded 13 years ago by conservative Democrats in the U.S. House of Representatives who felt "choked blue" by the extremes in both political parties. As the Coalition has grown, they've become known for a tough stance on fiscal policy, demanding accountability and a renewed focus on balancing the budget. Well, we're pleased today to say that Walt Minnick has been endorsed by the Blue Dog Coaltion. On a conference call today, Rep, Mike Ross (D-Arkansas) said that dozens of candidates ask for the endorsement each election cycle. This year it's been awarded to only nine, and Walt is among them. From the press release: "As a successful business owner and former U.S. Army Lieutenant, Walt Minnick knows how important it is for the federal government to pass responsible policies that protect our economy and provide for a strong national defense," said Rep. Mike Ross (D-AR), Blue Dog Co-Chair for Communications. "There is no group in Congress that is more united, more policy-oriented, or that works harder than the Democratic Blue Dog Coalition, and we are proud to offer Walt Minnick our endorsement today." Learn more about the Blue Dog Coalition here. Your Senate race is sure to be close. I know that your volunteer work can make all the difference. Keep in mind 2006 when we won new Senate seats in Virginia and Montana by just a few thousand votes each. 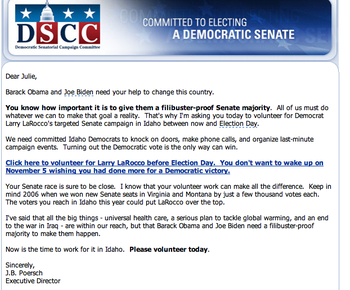 The voters you reach in Idaho this year could put LaRocco over the top. I've said that all the big things - universal health care, a serious plan to tackle global warming, and an end to the war in Iraq - are within our reach, but that Barack Obama and Joe Biden need a filibuster-proof majority to make them happen. This is the second Idaho race to draw national attention this year. The Democratic Congressional Campaign Committee (DCCC) added 1st District House candidate Walt Minnick to its "Red-to-Blue" list of competitive candidates way back in April. We are Republicans. We support Governor Butch Otter. We support Republican elected officials and candidates for office. And we support the traditional leadership of the Idaho Republican Party. We are Republicans, but we are also Idahoans. We love this state and want it to have the very best people serving as its representatives in Washington, D.C. That is why we will support Walt Minnick in November and ask that you do, too. Of course, there will be the usual bleating (already begun by Sali spokesman Wayne Hoffman in the Statesman) that these people are RINOs (Republicans in Name Only), but the language above makes it pretty clear that this is not the case. These are people who are willing to vote for the person, not the party, who know that Bill Sali isn't doing the job for Idaho. And for each one willing to be on this public list, there are no doubt thousands more.